There’s been plenty of talk lately regarding heavyweight champion Brock Lesnar and his “jovial” mood following a life-threatening bout with diverticulitis. 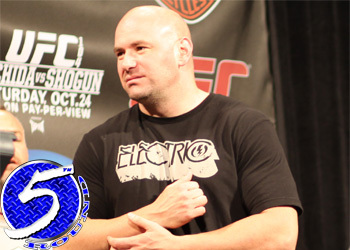 However, UFC president Dana White says we shouldn’t be fooled into thinking that he’s changed. “I mean he’s jovial, he’s Brock. Dude, not much is gonna change,” White said of Lesnar’s attitude towards the world. The champ recently said that between the illness and uncertainty of his future, his outlook on both training and fighting have changed. Despite his newly-found charm, it doesn’t mean White is going to make him the UFC’s next spokesperson. Lensar also said that he’s never been more excited than he currently is. To finally be able to return to the Octagon and defend his title against undefeated Shane Carwin on Saturday night at UFC 116 was something he couldn’t have imagined doing six months ago. “I could just sit back and say ‘you know what, this is a once in a lifetime opportunity.’ I’m in a great position. I’m very fortunate that I can even fight and I just don’t take anything for granted,” Lesnar said while appearing on The Jim Rome Show.